My colleagues, Dan Morgan and Michael Cookson have already reported very enthusiastically on this release and it’s easy to see – or hear – why. By coincidence, on the morning before I listened to this disc for the last time before writing my review I heard on BBC Radio 3 Dietrich Fischer-Dieskau’s recording of Lieder eines fahrenden Gesellen with Rafael Kubelik and the Symphonieorchester des Bayerischen Rundfunks, a recording made in the 1960s, I believe. That was a very neat coincidence for two reasons. Firstly on account of the thematic links between that set of songs and the First Symphony and secondly because, under Kubelik, the orchestral contribution had that fresh, open-air sound that characterises so much of this present recording, especially in the first movement. Right from the start I was impressed by the lovely, natural sound. The engineers have produced a very sophisticated, clean recording which allows detail to register yet also presents a very fine overall aural picture of the orchestra. So, for example, in the early pages the woodwind and the distant trumpets are beautifully balanced. Nézet-Séguin produces just the right amount of tension; you feel that Nature is stirring. When Mahler introduces his song ‘Ging heut Morgen übers Feld’ as his principal theme the music sounds fresh and Spring-like. I admire the way in which the conductor adds just the right little touches of rubato; nothing is overstated and, furthermore, the music seems to wear an effortless smile. As the movement progressed I admired very much not only Nézet-Séguin’s choice of tempi but also his management of tempo changes; this is yet another way in which the reading seems very natural. This conductor evidences a fine understanding of Mahler, not least in the way that he brings out, without affectation, the details of Mahler’s orchestration. At 13:38, only a couple of minutes before the end of the movement, Mahler finally unleashes the full orchestra – a glorious sound in this performance – and you realise how comparatively restrained has been most of what has gone before. From this point onwards the conclusion of the movement is packed with energy and high spirits. The Scherzo is given an ideal amount of weight yet Nézet-Séguin also ensures dynamism. The trio (from 3:35) is gently nostalgic. Here the playing is very refined indeed and the music is warmly inflected. Once again I’m impressed by the very subtle and appropriate use of rubato. When the scherzo material returns it’s played ‘mit Schwung’ and I love the contrast between this music and the trio, which really comes to the fore in this reading. The ‘Bruder Martin’ opening of the third movement is suitably spooky. At first the music is subdued, as it should be, and Nézet-Séguin and his splendid orchestra manage its growth very successfully. Mahler’s sound world is expertly brought to life. The delivery of the ‘Lindebaum’ episode (5:37 – 7:10) is simply exquisite with both the string and woodwind sections offering ravishing playing; everything in this passage is so subtly done. The return to the ‘Bruder Martin’ music is marvellously atmospheric. From the hushed ending of the third movement, superbly played, the finale erupts like a torrent. The opening is enormously impressive; the playing has great power and is very incisive. These first minutes are very exciting indeed and white-hot tension is generated. By contrast, the gorgeous, long-breathed string melody (3:40 – 6:26) has great beauty with the conductor and orchestra attentive to every dynamic nuance. I should also say that Nézet-Séguin prepares for the arrival of the great melody in a masterful fashion. The return to turbulence is hugely powerful but shortly thereafter there’s a brief passage (7:43 – 8:06) when the strings and brass play so quietly as to create the illusion that they’re at a distance. This epitomises, to me, the playing and engineering skill that has gone into this recording. At the other end of the dynamic spectrum the closing pages (from 16:39) are thrillingly played without the slightest suspicion that the tone is being forced and the recording conveys the full orchestral might effortlessly. The grandiose ending is exultant and uplifting with the Bavarian horns and brass in full cry. There’s no applause at the end but I bet that the audience went wild at the concerts from which this recording derives. This is, quite simply, one of the finest performances of Mahler’s First that I can recall hearing, whether on disc or live. The orchestral playing is magnificent while the interpretation itself is characterised by scrupulous attention to detail, by freshness and by an easily-worn sophistication. 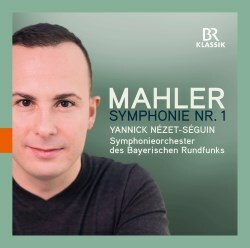 To date I’ve not heard too much of the work of Yannick Nézet-Séguin but on this evidence I’m not surprised he’s so highly rated; no wonder the Philadelphia Orchestra snapped him up. As for the recording itself, BR Klassik almost invariably produce good sound but this effort is out of the top drawer. I had hoped we would include this disc in the most recent session in the MusicWeb International Listening Studio. Time was against us on that occasion but this CD is definitely worthy of an audition next time. Until a few weeks ago if I’d been asked to recommend a recording of Mahler’s First I would have nominated from those versions that I’ve heard the magnificent performances – both of them live - by Bernstein and the Concertgebouw (review) or by Tennstedt and the LPO (review). This superb newcomer now most certainly joins that very select shortlist.